Students are required to step up from the mark as studies are getting really difficult. Colleges have changed their test criteria from writing a just one-word answer for the question to write a full essay rich of meaningful paragraphs. The reason behind doing this is the wide-spreading and accessibility of internet even on an average mobile phone. Almost all of phones can access Google or Wikipedia by means of WIFI or data package. The library of mobile can keep all the useful information, hundred times more than comparing to the human mind. You are just required to type the question and there is your answer. The memorization cannot worth being singular to form or write an essay. It requires much more effort; for instance, expressing the views or knowledge in a clear and concise writing. Students require understanding each and every complexity of writing skills. Here are the methods that students must approach for improving their essay writing skills. Essay’s growth depends on its structure. It must be having suitable and appropriate headings; it gives horrifying and awful feeling when analyzing a page or two that are completely having stiff content. Making headings or subheadings is the thing that gives a reasonable flow to the words that you are writing in your essay. The essay must have an introductory paragraph, a body that has discussion and arguments for supporting the discussion and a conclusion paragraph in which you restate your concept and techniques. Not only essay required a proper structure, the paragraphs that you have formed are also required to be in according to the standard necessities. The paragraph structure includes these 4 elements. Statement: It is the major tip which is required for each paragraph. It includes the importance of subject chosen and the ways in which they must get discussed. Mostly, statement tells readers the point of your discussion. This includes the arguments that are required to prove the statement. It makes worth of paragraphs. Here comes all the evidence that one can use for explaining or proving the statements. It is not always applicable; it requires some conditions to using it. If someone has to make it a part of their writing they can suggest all the possibilities of the outcomes in it that can give favor to others. For going on a trip you always need a plan and for executing it you need a map for checking out yourself whether you are on right track or wrong. Before starting essay writing; must plan the things you want to write. It won’t take much time just consider the information that is necessary for completing your essay. The plan will include all the informative keys of your essay; you can make an outline of your essay as well. Make it sure that you have mentioned all the important keys in your outline, this suggest you the path that you are needed to follow. Revision and editing are based on the circumstances in which you have written your essay. If you are having exams and the essay is given as an assignment then leave revising it and prepare for your exams. But, if you are having time than doing this process, it’s a must to do. Let yourself settle down first as you know yourself better than other so you are able to decide the perfect time to edit and revise your work. Make sure you have used all the required and perfect information. Change the weak sentences with strong ones. Change the words that are not completely fitting with the sentences. Do all the changes that are necessary for making your essay perfect. Don’t wait for others to force you for writing; it should be your focus. You can practice your writing by adding it in your daily timetable. By this way you will come to know about the writing techniques and your writing will surely get improved. You can take help from online essays for understanding the format of writing. 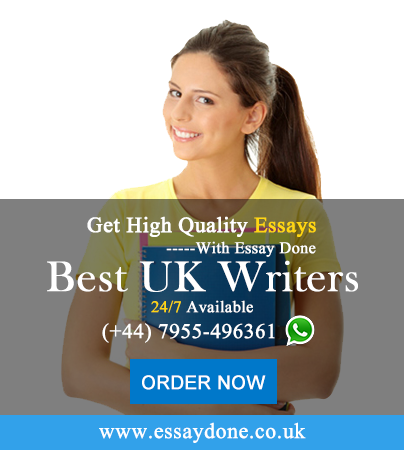 For getting a well-organized essay you can take help from EssayDone.co.uk the writers are expert in crafting the best essays on every topic.